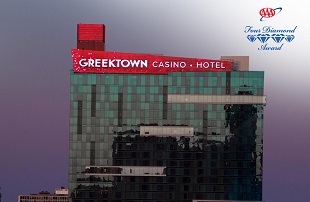 Greektown Casino-Hotel is proud to announce that it has again received the AAA Four Diamond designation. Currently, just 1,676 hotels hold the AAA Four Diamond rating in North America. Following JACK Entertainment’s acquisition of Greektown Casino-Hotel in April 2013, the property underwent notable changes to enhance the overall guest experience. The 400-room, modern high-rise hotel offers exceptional in-room amenities, ultra-fast Rocket Fiber internet, premium fine dining, breathtaking views and walkable access to downtown entertainment and sporting events. Greektown Casino-Hotel is part of a select group of establishments within North America. Only 6.1 percent of 27,000 AAA Inspected & Approved hotels receive this prestigious rating.